Osteoporosis is sometimes referred to as a “silent thief” because it usually has no symptoms. According to current estimates, approximately 1.4 million Canadians are affected by osteoporosis, or low bone mass. Approximately one in four women and one in eight men over the age of 50 have been diagnosed with this condition. It is important to note that it is normal to lose bone mass as we age, and that the definition of osteoporosis, or low bone density, uses the bone density of a young woman as the standard or “norm.” It is therefore logical that the bone densities of many middle-aged and older women are considered low. Nevertheless, osteoporosis can potentially diminish a person’s quality of life. As a woman loses bone mass and her bones become more brittle, she has an increased risk of fracturing (breaking) bones, especially in the hip, spine and wrist. However, not everyone with the condition breaks bones. Few people realize that they have osteoporosis until their bone health reaches the point where their bones may be at risk for breaking. Being aware of good bone-health habits and making some important lifestyle changes can prevent osteoporosis, or prevent it from developing into a significant health risk. Calcium is the major building block of your skeleton, and Vitamin D helps your body absorb calcium through your gut. They are both very important to bone health, but how much do people need? Osteoporosis is a condition in which loss of bone density and deterioration in bone quality causes bones to become more fragile, increasing the risk of fractures. Although it is very common in older adults, it rarely has any symptoms, so it’s important to be aware of risk factors. Balance makes it possible to stand, walk and move without falling. It’s essential for mobility and for fall prevention, and is a key element of fitness. For many people in midlife, and even for active older adults, the risk of an outdoor fall may be greater than the risk of a fall at home. Making small changes can help reduce that risk. Fall prevention averts more than just falls. It also prevents the injuries, chronic pain, disability, loss of mobility, and even deaths caused by falls. Because many falls – especially in older adults – occur at home, that’s a good place to start. Want expert health information based on your health priorities and life stage? 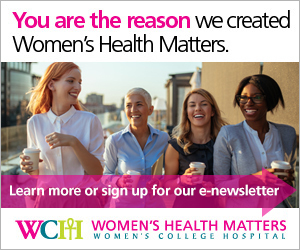 Visit myhealthmatters.ca for more bone & joint health resources developed by our experts at Women's College Hospital.